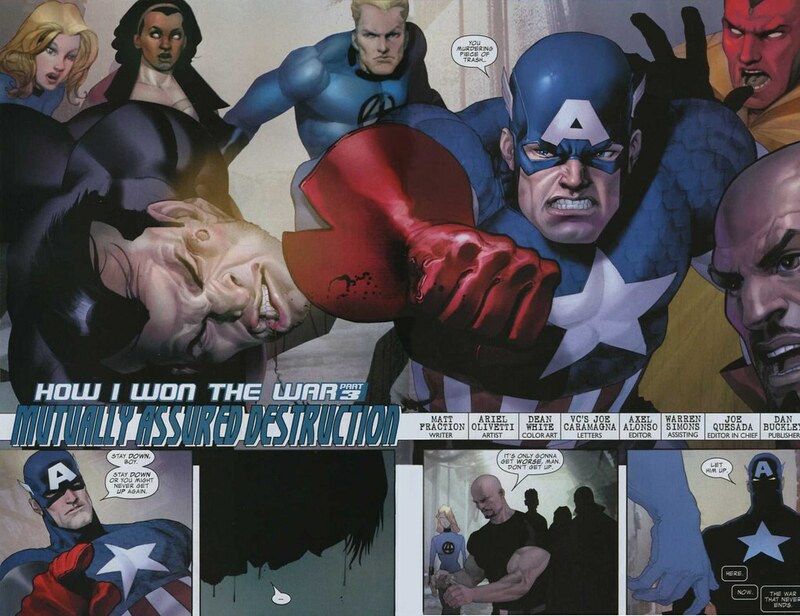 scans_daily | By request: Captain America beats up the Punisher... and lets him leave. 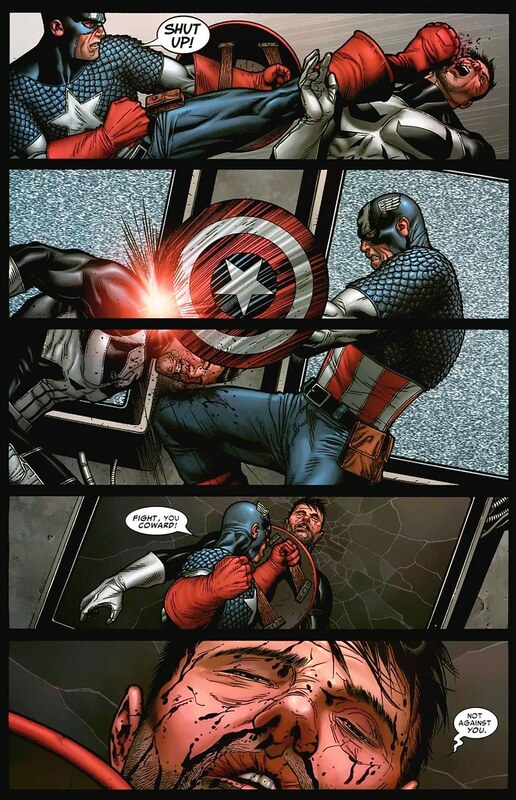 By request: Captain America beats up the Punisher... and lets him leave. 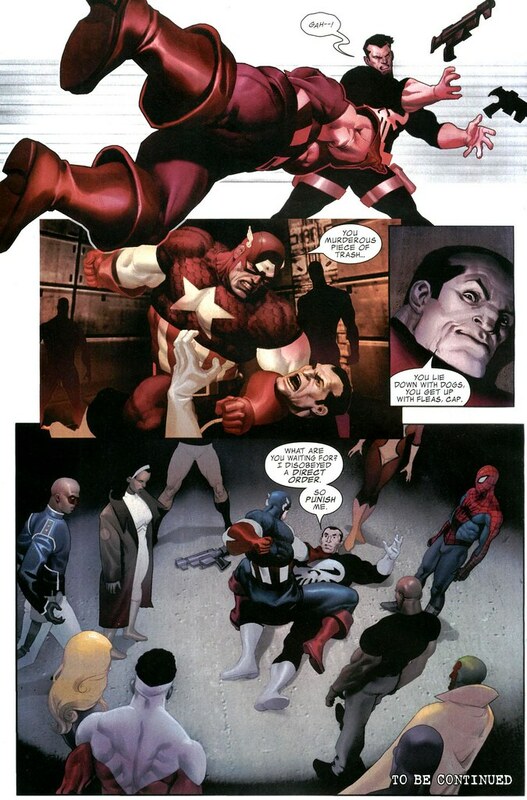 Upon request from wizardru, here's the CIVIL WAR scene of the Punisher killing two villains right in front of the Secret Avengers. 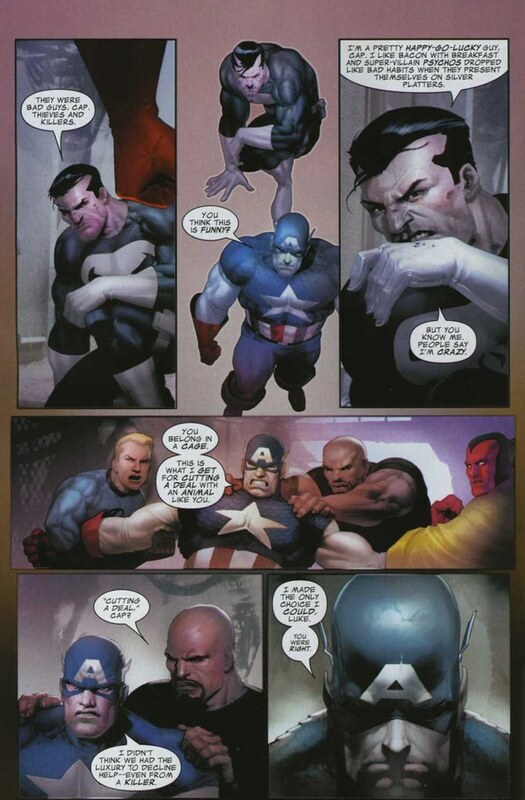 Frank gets a pass on this, even though Cap beats him up and Frank feels he proved something to Cap nevertheless. Goldbug was a Luke Cage foe obsessed with gold. He also was part of the Bendis SECRET WAR series that never really caught on. The Plunderer was Ka-Zar's brother. However, he re-appeared in MARVEL COMICS PRESENTS #5–6 (March–April 2008), explaining the man who had died was his "American representative." What's worse: the Punisher killing these two or Captain America willingness to work with them? 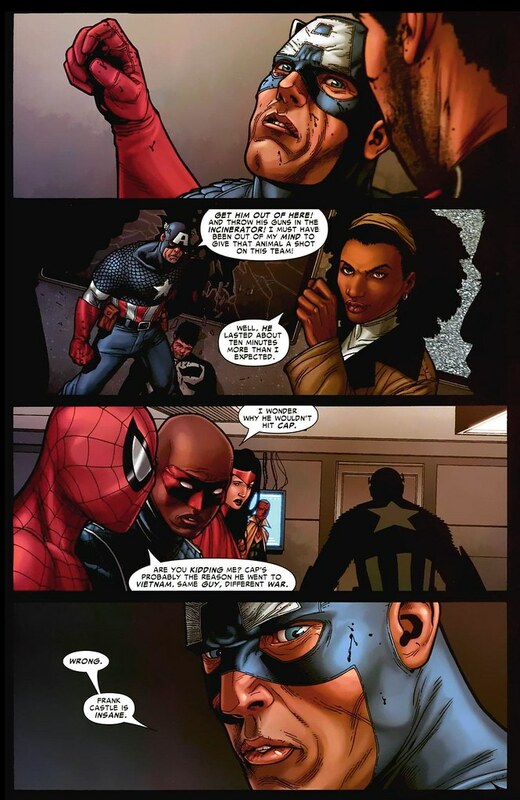 Oddly, the parody seems to have a more in-character Spider-Man than the actual CIVIL WAR story. Matt Fraction put his own twist on this in PUNISHER WAR JOURNAL #2 and #3. It is unusual that no one else in the room, given their powers, can do *anything* to stop the Punisher. The direct order seemed to be regarding lethal force. Of course, that non-lethal force had been against police officers. I'll pause for a moment to reflect on a line said in a podcast reviewing CIVIL WAR #6. It was either a Marvel podcast or a Marvel-themed podcast, but I remember the line very well. "Now, the Punisher's crazy. He's a killer. But he's not an idiot." This is intercut with a flashback to Frank at boot camp, being asked by "Captain America" to hit him. Frank refuses. This is one of the "alternate" Caps, and probably the "Crazy Cap" from the 1950s. 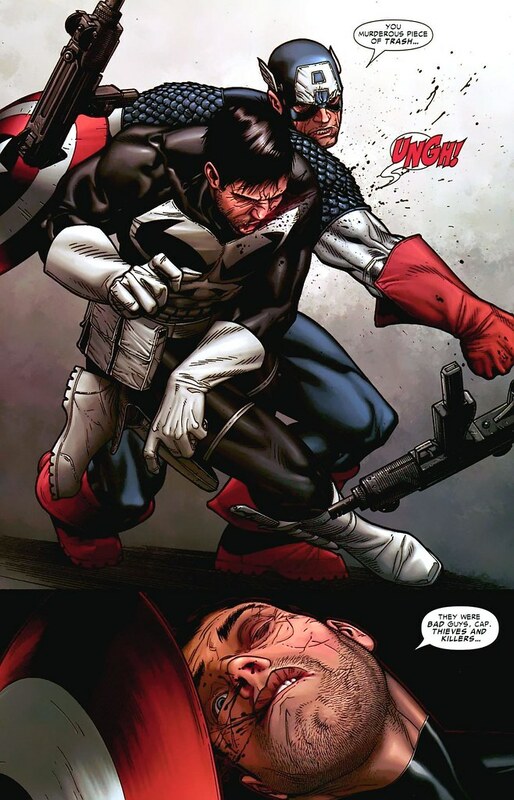 The Punisher is deliberately provoking Captain America. I'm starting to question the "crazy, but not an idiot" idea. "I got to doin'." As someone said in a review of this issue, Frank Castle isn't Mal Reynolds (from Firefly and Serenity). 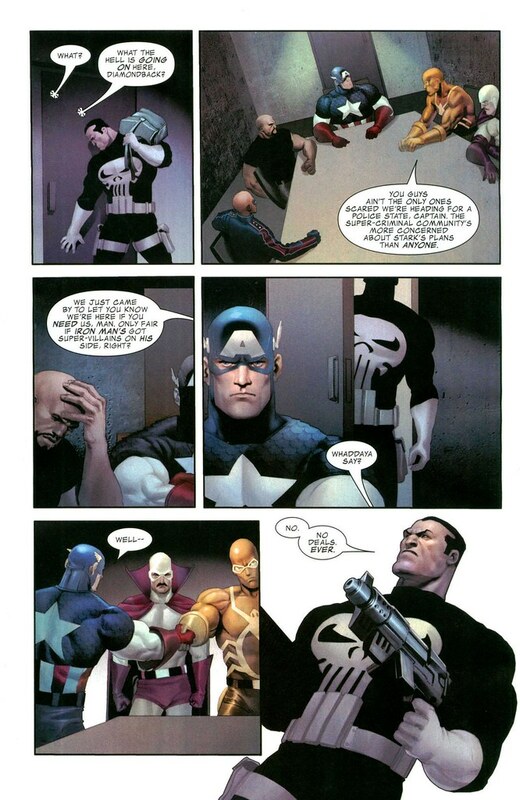 Captain America wanted the Punisher on the team to do the dirty work? Well, it's pretty much the same reason they wanted Wolverine in the New Avengers, so it isn't that OOC. 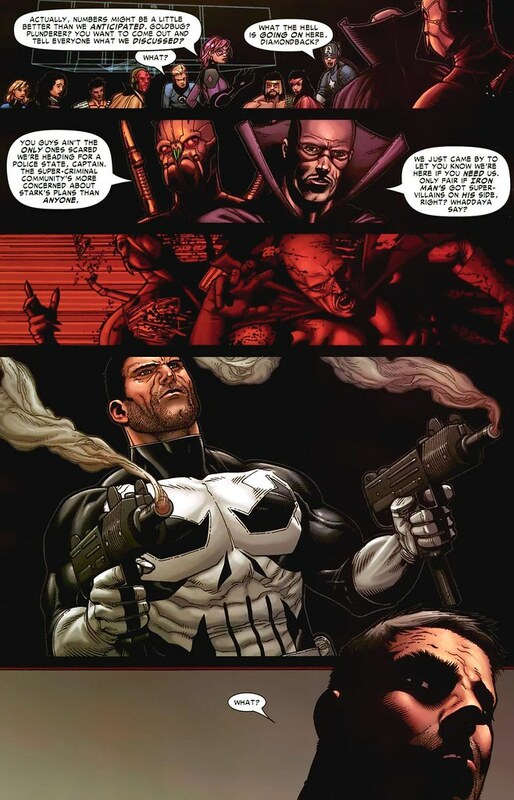 Meaning the Punisher is right, although I doubt Cap had "executing villains that want to help out" in mind. Scenes of Frank Castle's earlier life often show that he had something wrong with him. It just wasn't "kill all criminals" wrong until his family was murdered. 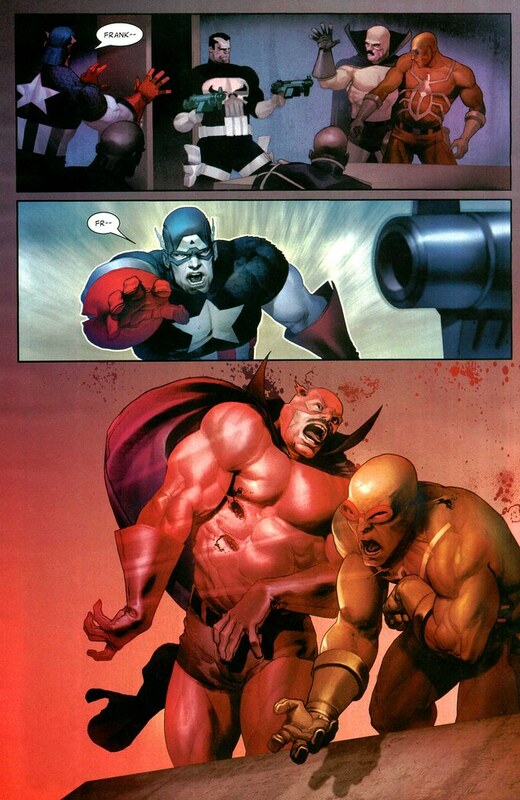 So... the Punisher killed two super-villains and then let Captain America beat him up just to prove a point? Anyone know the point? And none of the heroes do anything to stop the Punisher from LEAVING. I usually criticize Spider-Man for doing that, but this was a WHOLE ROOM of superheroes!